Skippy was a member of a litter that my friend Fred said I had the first pick. Fred has a large cages in his garden, with various quantities of ferrets in them. On this occasion there where two litters. One mother was quite happy to let the kits roam about. The other mother would collect up her kits and take them back to the nest box., in the process she returned one kit and others would escape. Eventually she returned them all and stood in the entrance block in the potential escapee kits. Skippy seemed to be the root cause of unrest in the litter, always on the move and crying out. When I collected him from Fred he remarked Skippy had a big head. Skippy was 10 weeks old and at home when I put him in his cage he started crying because he wanted attention and probably missed his family. Soon he grew to be one of my larger ferrets, docile and easily handled. 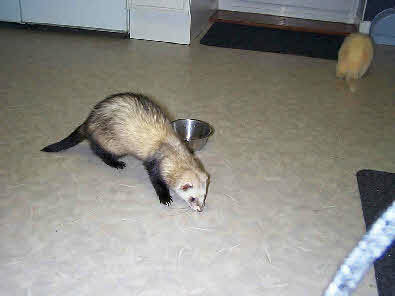 On Christmas 2000, I had a surplus of turkey, so I fed some to the ferrets. Skippy approved and one occasion when he was playing with a toy, I gave him some turkey. Shrieking as he snatched at it, he bit my fingers. Subsequently I became more cautious. On other occasions he was often robbed of his treats by Toby or Sandy, they ate faster .